Sometimes a normal office is not suited to your company needs. It is nice to have a large spacious office, you may even have a large workforce, but if they are never in the office, what is the point of all that space? Many companies would benefit from downscaling their office needs, whilst upscaling the ability of the company. This is possible through the use of a Virtual Office Client. Acreman IT has a small work force spread over a wide area, moving to a larger office would not benefit them, but the Virtual Office Client and Distributed Phone system is ideal. Steve Acreman works from home in Omagh, Northern Ireland, he employs a team of freelance engineers responsible for the IT support of his clients. The company has 3 regions England, Scotland and Wales. The accounts are handled by a friends company that has relocated to Cardiff in Wales. The team of Engineers run shifts for each area, and 3 of them are on call at any one time. Shifts are organised by Steve and emailed out to the Engineers, they then notify the Head Office if they are available for that shift. When a call comes in to the Head Office in Ireland, Steve then has to phone the Engineer on call for that area. When the Engineer has finished, they phone Head Office and supply the job information, which is then phoned through to the Accounts who deal with the invoicing. 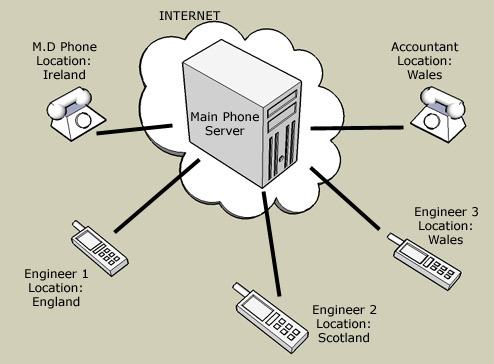 Through the new phone system each area ( England, Wales, Scotland ) has one phone number to call, this is then routed via the phone system to which ever mobile number is associated with the scheduled engineer for that area. This allows the appearance of a larger organisation while minimising the administration and complication of the old system. When an Engineer changes shift, a simple change to the phone system allows the phone number to be redirected to the new Engineer. "Before we started using the system, we had to route all calls to the main office, but now the calls go direct to the engineers. And when they need to phone in the invoices they get a single number to our accountants in Wales! I never thought it would be this easy to work with people so far away!" Time and information was lost with the 2 stage phone system, now information can be relayed to the right person on the first call. Expansion need not be in a physical medium, so much data and communication needs to be transferred that virtual expansion can not only improve the speed in which information is transmitted, but reduce the physical need and cost.